USDJPY is affected by some economic data such as corporate services price index, Durable Goods Orders and Initial Jobless Claims. As the chart shows, there was a sharp fall yesterday followed by two bullish candles and a pullback after. Today it rose a little bit but created a negative candle right away. The support lies at 109.660 with resistance at 110.100 which both lines are above the monthly pivot point at 108.380. Candles have created a rising wedge which suggests and price decline in the future. The MACD indicator and the RSI are both in neutral zone not providing any clear signal for traders. The EMA of 10 is located above the EMA of 75 showing the growth of price in the recent days. 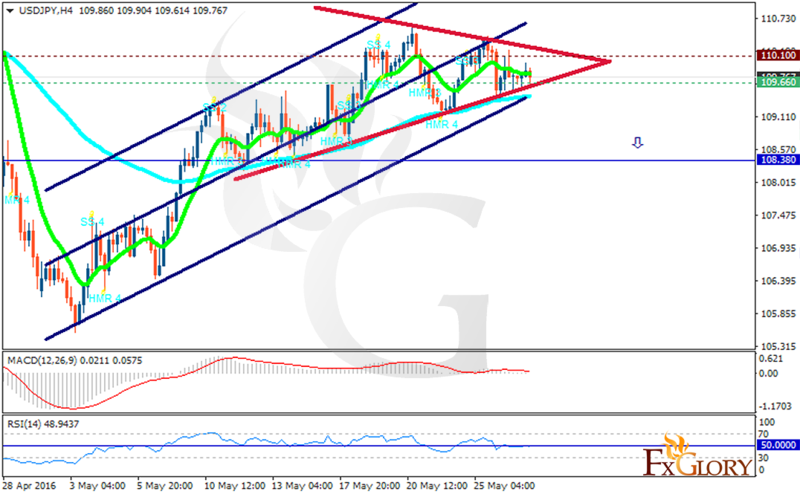 Considering the H4 chart with this rising wedge the downward trend will continue until it reaches 109.00.